The Jingles, A Revolution in English Pronunciation Therapy : What are the Jingles? Proper pronunciation leads to improvement in listening comprehension. Pronunciation is a very important aspect of one’s overall English ability. Once you acquire a nativelike pronunciation of English, you will be able to understand how native speakers of English move their mouths. This naturally leads to better listening comprehension and a larger vocabulary. The Jingles is a system of muscle training which leads to improved pronunciation. The system was developed by Steve Walker, linguist, after he analyzed the movements and musculature necessary to speak English. Have you ever considered the importance of pronunciation in enhancing your overall English ability? Your improvement in English pronunciation will dramatically raise your listening comprehension ability. Speakers of each language have their own distinct form of muscular development. Thus, for people whose native languages are phonologically quite distinct from English, such as, say, Japanese or Vietnamese, it is very difficult to imagine how native speakers of English move their mouths, for that movement is very different from the movements used in producing the Japanese or Vietnamese languages. For such people, acquiring good listening comprehension ability is impossible even with a deep knowledge of English. Through Jingles training, you can acquire nativelike pronunciation of English and will be able to imitate the mouth movements of native speakers even without trying. And as a result, your listening comprehension will improve dramatically. When good listening comprehension ability becomes yours, your vocabulary will increase rapidly. You may have noticed that memorizing words of your own language is far easier than memorizing English words. This is because you haven’t understood the sounds of English words or acquired the proper musculature to produce those sounds. Once you gain the ability to pronounce English properly, English words will enter your memory naturally, just as words of your native language do. The Jingles make it possible not only to develop the musculature needed to acquire nativelike pronunciation, but also to foster your overall English ability. Why is muscle training necessary? It is said that Japanese and English split from the same source some 15,000 to 20,000 years ago. That’s why Japanese have to train those muscles needed to speak English for acquiring nativelike pronunciation. 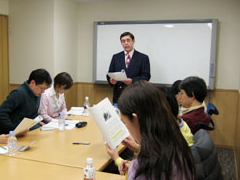 Many people say that people from certain countries such as Japan and Vietnam are poor English speakers. The reason for their poor English arises not from the fact that they are inept users of human language but rather from the linguistic separation between their native languages and English. Every language spoken today has emanated from only a few sources. As we humans evolved, our languages evolved too. For example, Japanese and English split from the same source about 15,000 to 20,000 years ago. In other words, Japanese people have, during that span of time, developed a unique method for employing the musculature needed to speak Japanese, one which is very different from that needed to produce English sounds and sound combinations. Ironically, it was naturally assumed that pronouncing English was possible for Japanese people because Japanese and British (or Americans) are all human. What had been overlooked was the fact that the separate evolutions of English and Japanese led to separate utilizations of respectively differentiated musculatures. On the other hand, Dutch and English for example, went their separate ways from the same linguistic source about 700 years ago. Thus, Dutch and native English speakers share similar techniques in the utilization of the muscles of the mouth, throat, and abdomen. Consequently, Dutch people can communicate quite well with native English speakers without worrying about pronunciation or grammar, simply replacing Dutch words with their English counterparts. Things are not the same with native speakers of, say, Japanese or Vietnamese, whose musculatures for pronunciation are not properly developed for speaking English. This is why the muscle training made possible by The Jingles is necessary for people whose native languages are linguistically very different from English. You may think that developing musculature must require enormous amounts of training. But there is no need to worry about that, because The Jingles have been designed specifically to foster efficient low stress training. The system was developed after long years of linguistic and phonological research by Steve Walker, linguist, as he analyzed the muscular movements needed for pronouncing English. That’s why The Jingles training system are very efficient and ideal for developing the musculature required to speak nativelike English.